The following article is a guest post by Parker Milner, @dinnerwithchuck. Upon arrival, I am taken to my seat on the far left next to the window. I order a bottle of cold sake and then begin watching the five chefs behind the bar who have not even noticed that diners are starting to arrive. For those who haven’t experienced a sushi chef’s choice meal, known as Omakase, there are a couple things to know. The phrase Omakase means “I’ll leave it up to you,” so the head chef controls the entire dining experience. Many will be surprised to find there is no soy sauce for dipping. Instead, it is applied with a quick brush by the chef and wasabi is often delicately placed in between the rice and fish. The sushi arrives one piece at a time, sometimes two, and you are free to use chopsticks or your hands. You must, however, indulge the moment the creation hits the plate. Before I can even take a sip of my sake, a piece of salmon over rice comes my way from none other than Head Chef Daisuke Nakazawa, who has been satisfying New Yorkers at this location since 2013. The silky rice and fish combine perfectly into a delicate marriage, and the bite is over way too quickly. From this point on, I am completely hooked. Lucky for me, the pieces start coming out rapidly as the chefs continue to cut, roll, and repeat behind the bar. Yellowtail, scallop, and octopus are followed by two pieces of sea urchin, or uni. The climax of the service occurs when three consecutive pieces of Toro (bluefin tuna belly) come out; first Akami (lean), then Chutoro (medium-fatty), followed by Otoro (fatty). I look up and down the bar and see each diner slowly chewing the Otoro not wanting the moment to end. We all share a variation of the same expression; astonishment, bliss, curiosity. How can food taste this good? The most complex flavors rush to each part of my palate, but one thought shines. That was downright delicious. At one point in the meal, the person I am dining with needs to step outside to make a phone call. I think little of it at the time, but Nakazawa clearly notices as he continues to glance out the window to his right at my companion. As Nakazawa’s stress visibly starts to build, I realize that he has not served a bite of sushi in over five minutes, which is longer than normal. At this point, I feel a few beads of sweat on my neck; he is waiting on my friend to serve the next bite! I immediately look outside towards my dining mate with a sense of urgency, and luckily he sees my expression, understanding that something is off. He wraps up the call within minutes and rushes back inside, where he is greeted by a smiling Nakazawa. The world-renowned sushi chef proceeds to pull his chair out, trot back behind the bar, and place the next bite on each guests’ plates. This is the moment I realize that this small man who minutes earlier flipped a live shrimp on an un-expecting diner’s plate has found the perfect balance between a relaxing evening and an attentive, diligent Omakase service. 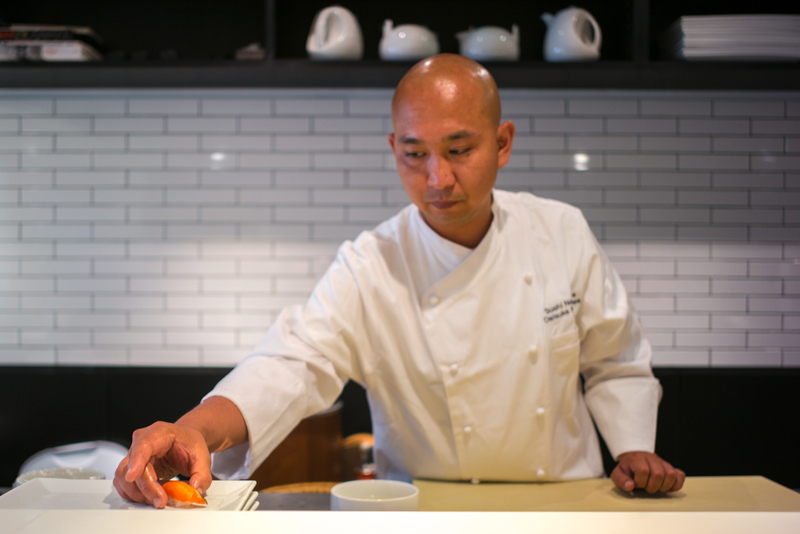 Chef Nakazawa cares deeply about the quality of sushi he provides, but what sets him apart is his focus on the entire dining experience. That perfect balance between energetic and authentic on a nightly basis is exactly what keeps sushi fanatics, like me, coming back for more.